There are two kinds of blurbs, one another author asks you to write praising his or her book, and the one you must construct for your own book. In either case, I usually keep mine to about two sentences. I recently did one for a friend and she liked it so well it's going on the front of her book. For some reason, I find it much easier to do for others than for myself. The blurb I'm working on now is for the next Deputy Tempe Crabtree mystery. I've sent one in to the publisher, but I'm not really happy with it. 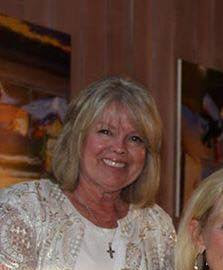 The book is about a trip Tempe and her husband take to Tehachapi. He isn't happy about the destination as they'd planned to go to the coast and visit her sister. But a call from a ghost hunter has intrigued Tempe. 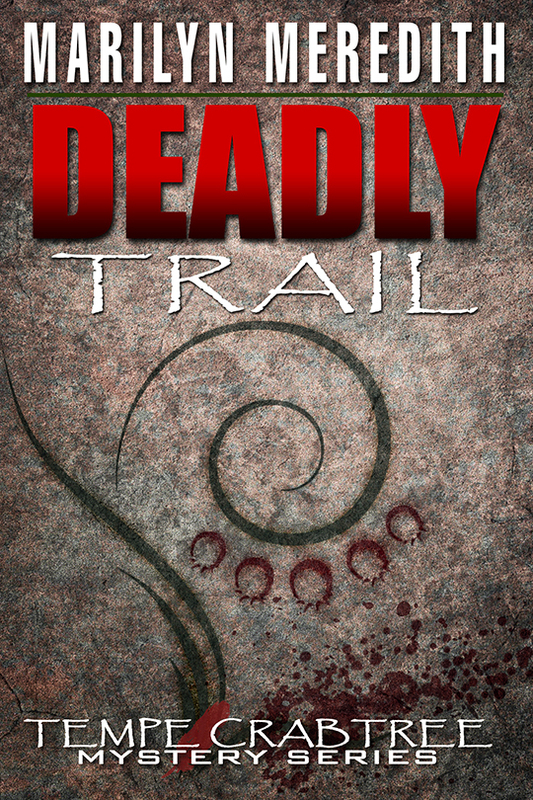 Of course there is a ghost, messages on the wind only Tempe can hear, and a murder of course. I've tried several different ways to present this, and as yet I'm not thrilled with any I've come up with. 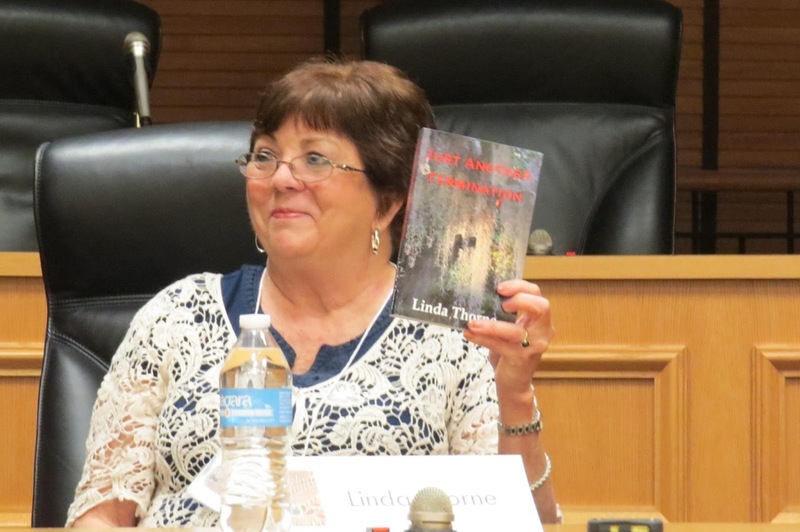 Recently I attended the Tulare-Kings Writers group and the topic was on writing blurbs. It helped, but I'm still not sure what I'm going to use. My critique group also had some suggestions. How about the rest of you writers? 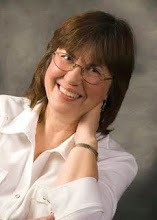 Does writing blurbs for your books or others come easy? And readers, does an intriguing blurb often cause you to buy the book? Writing can be hard work, author promotion laborious and grueling, and as far as making money, well, that seems to be the biggest challenge for most of us. Do we give up? No. We enjoy writing and much that goes with being an author is just pure fun. Author panels are one of the more uplifting things we participate in. Four weeks ago, I was at the Killer Nashville International Writers Conference, sitting on a panel. Two days later, still at the conference, I was sitting on a second panel. I could go on and on for hours talking about the Killer Nashville Conference with all their panels, writers’ sessions, workshops, and more. 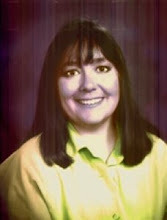 For years before I was published, I went to every author event I could make hoping to learn how to become an author. How I envied the authors who spoke at sessions or with a group. I usually joined in when it was time for audience participation, something I did in preparation for the day when I too would be a speaker or panelist. 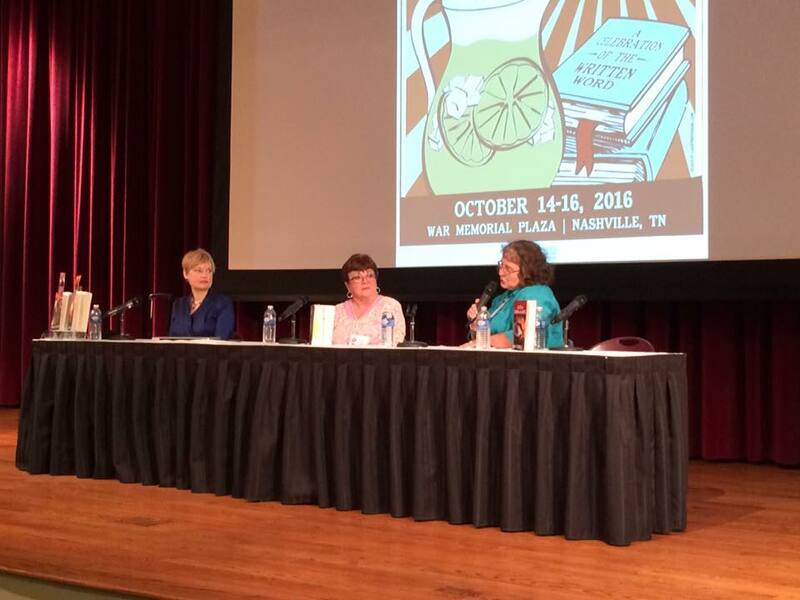 The first official panel I participated in was at the Southern Festival of Books in mid-October 2015 here in Nashville, Tennessee. The panel was called: “Who Can You Trust – Three Mysteries.” The other authors with me were Phyllis Gobbell and Elise Blackwell. Our moderator did a great job injecting some “umph” into this presentation. As you can see I was in my glory. 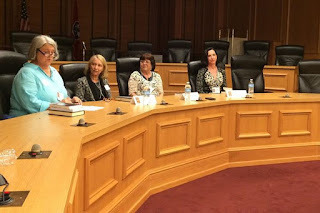 The Killer Nashville conference, always held in August, was moved temporarily to late-October in 2015 and I took part in their panel called "Debut Authors". 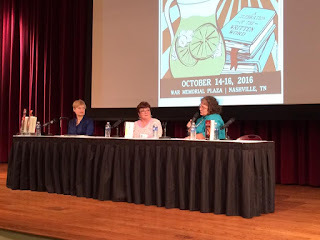 In 2016, The Southern Festival of books invited me to be part of a panel of authors for a second year. 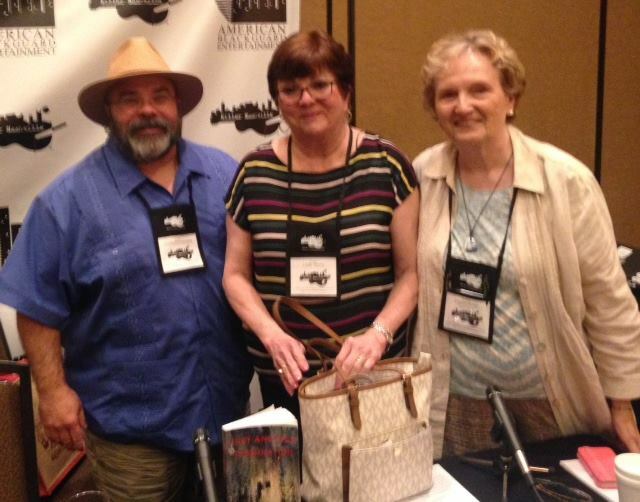 I joined Kelly Oliver and Jaden (Beth) Terrell to talk on "On the Case: Private Eye Series." To get on another such group with this Festival will not happen again until I publish a new book. But I'm still invited to other panels even without a new publication. 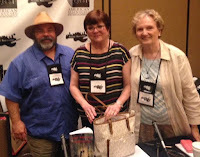 I appeared on a non- traditional rotating panel at Bouchercon 2016 in New Orleans, I've been on ones at bookstores, and, of course, Killer Nashville year after year. Author panels are handled pretty much the same where ever you find them. They primarily provide new or midlist authors an opportunity to reach a small group of book-buyers, but best-selling authors appear on them too. I’ve been on panels with bestsellers. I’ve also gone to panels where the “big-huge-names” in the writing world participated. If you’re going to be part of a panel of authors, my advice is never worry about what to say. If you’ve written a book, you’ll know it inside out and backwards. There’s no way to be blindsided by a question. Most of your answers will come out naturally with enthusiasm because you are talking about your work of love. If you wind up on a panel with a talker, don’t worry about how to handle it. I’ve had it happen and the moderator is usually an expert on cutting that talk short. If not, I’ve butted in myself. It’s easy to interrupt and make a couple of comments to pull the talker back into the rhythm of the group. 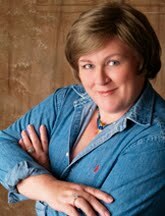 Do any of you want to share your experience(s) on a panel or experience(s) watching an author panel? I'm so happy! Next week we're off to the fantastic Tradewinds Resort in St. Pete Beach, Florida for the Novelists, Inc. (NINC) conference. The Tradewinds is a world-class resort, with many and varied restaurants (from crystal-and-white-tablecloth to a funky cafe open to the sea breezes), several bars (from dark and elegant to a rustic palapa on the beach) and all kinds of entertainment, including a multi-story inflatable water slide. As great as it is, though, I am not a resort person and probably would never go there if it were not for NINC. So what is NINC? It is a professional organization for professional writers. It is the greatest group for working writers that I have ever found. There is an e-loop, so we can stay in touch with each other, but no local chapters. In a way that's sad, but most of us are so busy working we don't have time to socialize. Except at conference. Held in late September/early October every year, the NINC conference is the only conference I most definitely will not miss. (I hope I didn't jinx it by saying that...) Once a year working professional writers can get together to learn, to meet with friends and get up to date on industry news. And have fun. It's great to see friends you don't see from one year to the next. It's also great to get to talk to industry people (agents, editors, publishing people, tech people and more) in both business and social gatherings. One thing that makes it so great is that we writers are all pretty much in the same place - oh, there are best-sellers with dozens of books and fairly new writers with just two or three or four books, but all are published and all have met certain standards to qualify for membership. All have dealt with traditional publishers or are self-publishing or both. We all speak the same language and know what the others are talking about. It creates a feeling of being among family that is unprecedented. If you are a published author, look into joining NINC. It's one of the best things you can do for your career, whether you go to the yearly conference or not. There are stiff requirements - number of books published and by whom, and a financial floor, but nothing that should be too difficult for a professional writer. Can you tell I'm excited? The Husband (who moonlights as my assistant) is coming too, and as always we've reserved a waterfront room so we can sit on the balcony and watch the moon on the water after going out for a romantic dinner. Then, during the day, we can see friends and go to workshops and party... never forget the partying! Hopefully one of my dearest friends in the world who lives about half an hour from the Tradewinds will be able to come in so we can take her to dinner. This year I'm even reporting on two different workshops for the NINC newsletter! Unfortunately, before we can leave there is a lot to do. I have a new book (A Well Mannered Murder) I want to finish before we leave so I won't have it hanging over me while we're at the conference. There's always housework, and laundry, and packing... I'd better get busy! The next Rocky Bluff P.D. mystery, which I titled Tangled Webs is supposed to come out in October. Everything has been turned around with getting a new publisher (Aakenbaken and Kent) for this series. All the earlier books had to be re-edited and received new covers--the idea to make it obvious it's a series. 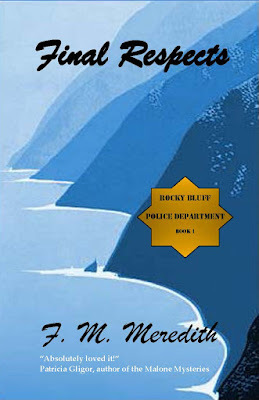 In the past, the latest Rocky Bluff P.D. mystery came out at the first of the year. I was far too busy with the re-editing to finish the latest and get it sent off. The same type of things was happening with the Deputy Tempe Crabtree series--some of the earlier books needed re-editing and new covers to match the covers in the newer books. So while I was re-editing, of course the next book in the series was on hold. August has always been the month for a new Tempe to come out. Not this year. 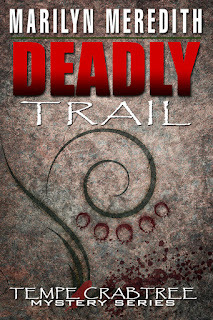 The new cover for the very first book in the Tempe Crabtree series. The book is finished and is called Spirit Wind and my critique group has heard it all. It's been sent out to a Beta reader. Once I hear back from her and make any changes she might suggest, I'll send it off to Mundania Press where their editor will take make the final edits. Once both those books are out, I'll be busy with promotion. Fortunately, I am signed up for quite a few events. In the meantime, it's time to start thinking up ideas for the next books. How well do the rest of you do at waiting? For me, it's best to keep busy. What do I think about When I write? 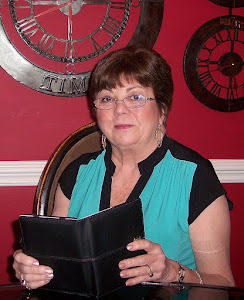 When I write, I don’t consider my readers likes and dislikes: I approach writing as if it’s a treasure hunt and the treasure I’m searching for is the truth—what choices would these characters truly make in these situations? What would these characters honestly feel? I want my characters to be as real and as honest as possible, and since they ultimately drive my stories, my books don’t always turn out how I initially envisioned them—or in ways that I think readers might want. 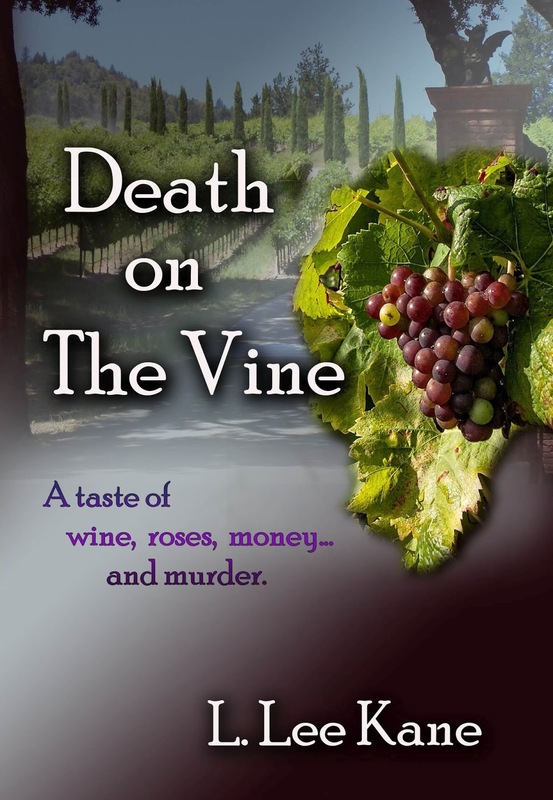 For example, I chose a new narrator for Death on the Vine. Daisy, my new narrator, was not universally liked and many of my readers were unsure about my choice to make her the main character. But I actually think their dislike of Daisy made the book stronger. Since Daisy was not a beloved character, I knew I’d have to work really hard to win readers over to her side. I knew I couldn’t just throw her on the page and assume readers would follow her—I had to fight to make readers fall in love with her. When I write I don’t consider book sales, I write because I enjoy the process and every day I learn something new: When I first started writing, before I actually sold anything, I used to think about sales all the time. I stalked agents and continuously read their tweets and blog posts about the market. I studied the books that everyone was buzzing about. But my studies never led to selling a book. In fact, they almost held me back from writing The Black Madonna. When I first drafted The Black Madonna, I was told by more than one person that books with a historical perspective were hard sells—no one was looking for that—and the creative historical market was saturated. 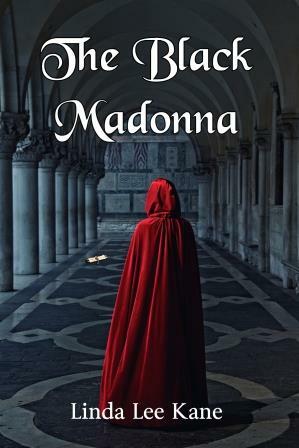 The Black Madonna didn’t feel like a safe book to write, but I’d tried to write safe books, which hadn’t sold much, and I was obsessed with the idea of the Knights Templar and the Cathars, a religious group that Pope Innocent wanted to be destroyed. The Black Madonna was the book I wanted to read. So despite the appearance of the market and various agent wish lists, I liked to believe that if I wanted to read it, others would want to read it as well. I still think it’s good to be aware of what’s selling, but I don’t usually consider it when choosing what I write. Instead, I try to find the idea that I’m obsessed with because I believe that if I’m passionate about something, I’ll find readers who feel the same way.